Wayne State University Press, 9780814334942, 263pp. 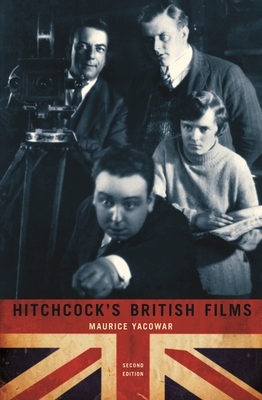 Originally published in 1977 and long out of print, Maurice Yacowar's Hitchcock's British Films was the first volume devoted solely to the twenty-three films directed by Alfred Hitchcock in his native England before he came to the United States. As such, it was the first book to challenge the assumption that Hitchcock's "mature" period in Hollywood, from the late 1940s to the early 1960s, represented the director's best work. In this traditional auteurist examination of Hitchcock's early work, author Maurice Yacowar considers Hitchcock's British films in chronological order, reads the composition of individual shots and scenes in each, and pays special attention to the films' verbal effects. Yacowar's readings remain compelling more than thirty years after they were written, and some--on Downhill, Champagne, and Waltzes from Vienna--are among the few extended interpretations of these films that exist. Alongside important works such as Murder , the first The Man Who Knew Too Much, Secret Agent, The Lady Vanishes, and Blackmail, readers will appreciate Yacowar's equal attention to lesser-known films like The Pleasure Garden, The Ring, and The Manxman. Yacowar dissects Hitchcock's precise staging and technical production to draw out ethical themes and metaphysical meanings of each film, while keeping a close eye on the source material, such as novels and plays, that Hitchcock used as the inspiration for many of his screenplays. Yacowar concludes with an overview of Hitchcock as auteur and an appendix identifying the director's appearances in these films. A foreword by Barry Keith Grant and a preface to the second edition from Yacowar complete this comprehensive volume. Anyone interested in Hitchcock, classic British cinema, or the history of film will appreciate Yacowar's accessible and often witty exploration of the director's early work.